Growing up I often heard phrases like "If you can't say somethin nice, don't say nothin at all" (Thumper) or "Better to remain silent and be thought a fool than to speak and remove all doubt" (Abe Lincoln?). I was known for speaking too often, too quickly, and with too much of a Southern twang. And I say what I feel. Which I always thought was a strength of mine. But sometimes my words are TOO strong. Even for my 6'2" 200 lb husband with enough grace to fill a football stadium. I don't know about you, but a lack of Wisdom has caused me everything from embarrassment to regret on quite a few occasions! Wisdom. This word has taken on a new and personal meaning for me, especially since I became a wife. It's no longer a "church word" that's kind of abstract and ambiguous. Wisdom is what I plead for everyday when I commune with my Father. This word has become beautiful and sacred to me because I know I can never attain Wisdom in my own strength. 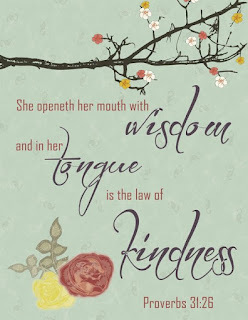 She openeth her mouth with wisdom, and in her tongue is the law of kindness. Oh, to have the spiritual discipline of our Virtuous Woman! Good news is, she is just an example of perfection and we serve a gracious God who calls for a pure heart, not perfection! She opens her mouth with Wisdom. Not only is there Wisdom in the words she says, but in when she says them. And the -eth on the end shows that she continually thinks before she speaks. We all know that the first step in putting our foot in our mouth is actually opening our mouth. 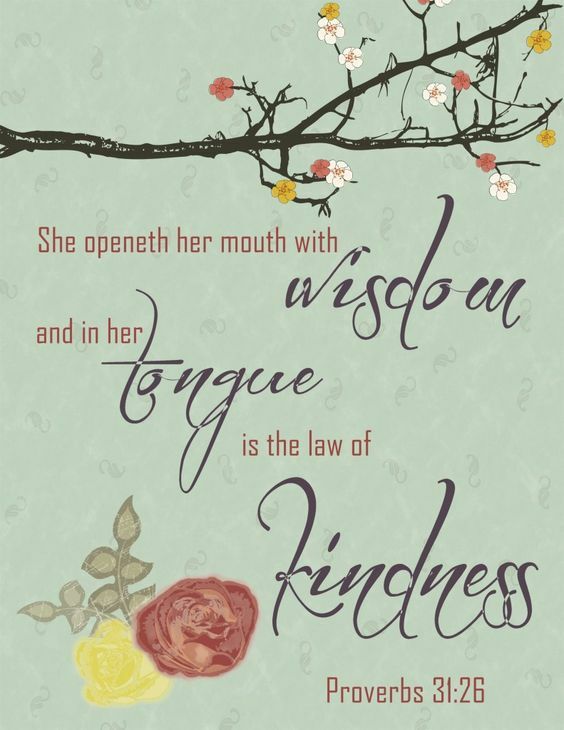 In her tongue is the law of Kindness. The phrase "in her tongue" means in her everyday conversation, daily interactions. She is not putting on a show here. Every time she speaks to her husband, her mother, her coworkers. Even her best friends that don't mind if she doesn't filter her thoughts. Her communication is for one purpose, to show love. It's so important to her that it may as well be a law. I find it interesting that the word "law" is used. This means that there are consequences for "breaking" this law. But how often do we feel guilty for "victimless crimes" like gossiping or being brutally honest to the point of pain? Lord, I pray that we would feel the gravity of our words the way others do, the way You do. What would our lives look like if we lived by a "Law of Kindness"? Remembering that this is a hypothetical embodiment of Godly perfection, we know it would be impossible to never speak anything unkind. But if our goal was to show Love every time we spoke? We could change the tone of our home, the strength of our relationships, our outlook on life! Maybe we could even lead to people to Jesus. Believe me, a feat this huge requires more than just a New Year's resolution. It takes holy encouragement and surrender to God on a daily basis. King Solomon, the receiver of the words in Proverbs 31, was the wisest man on earth. But it wasn't just his awesome Mom that passed along these words of Wisdom that got him where he was, he prayed diligently and fervently for Wisdom. Instead of riches and fame and power, he asked God for Wisdom. I want to be like Solomon. I want to set aside my pride and allow God to inundate my communication with Wisdom and Kindness. Lord, You said in Your Word that Wisdom is prized beyond rubies, and so is a Godly woman. I pray that You would replace my words with Your Wisdom today and to speak kindness over each day for Your glory. Amen.